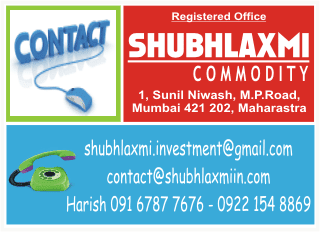 MCX Natural Gas (NG) was consolidating in the past few weeks. The consolidation has taken form of a bearish triangle. The last leg of the pattern got over near the 40 day exponential moving average (DEMA) and the daily upper Bollinger Band. From there NG has started tumbling down. In the last session it has given a breakout from the triangle. The daily momentum indicator is poised to start a new cycle on the downside. On the downside NG is expected to target the low of Rs112.3 and the weekly lower Bollinger Band (Rs106.7). Reversal would be above the swing high ie Rs129.6.